Ducted Air Conditioning Versus Split Systems. What’s better for your home? Finding the right air conditioning system for your home means carefully considering comfort and cost. Each of the two main types of systems — ducted air conditioning and split systems — offers different advantages and disadvantages that you need to know about when making your decision. This type of cooling system can effectively cool your entire home because of its network of ducts that are hidden within your walls. This allows for discreet cooling that you can easily control by adjusting the thermostat to the desired temperature. By purchasing a reverse cycle air conditioning system, you can also get heating and cooling from one convenient system. A zone system gives you the maximum in flexibility since it allows you to choose which rooms to air condition at one time. 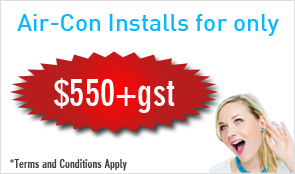 A ducted air conditioner is more expensive, both in terms of the cost of the system as well as its installation. Many homeowners find that this expense is offset by the cost of running it over time. A split system air conditioner is designed to cool only the room where it is placed. This single unit is installed directly in the room that you want to cool. It’s attached to a compressor that is located outside the home. This can be seen as a disadvantage for some homeowners who think the sight of the unit takes away from the appearance of their property. Many of the advantages of a split system outweigh this disadvantage though. Split systems are a popular option because they offer an affordable method of cooling your home. You can add on units over time when it suits your budget. When compared to a ducted system, a split system is generally cheaper to run because you can choose to hear only those rooms that are in use. When it comes to repairs, the costs for a split system are typically lower. One unit that needs repair does not affect the other units on the system so some rooms of your home are still able to be cooled. Platinum AC provides installation and repair for both ducted air conditioners and split systems. Contact us today and let us help you decide which system is right for your needs.